Location: Hot-Aigues, in the Cantal departement of France (Auvergne Region). Ownership / Access: Municipality of Hot-Aigues. Now a hotel and restaurant. 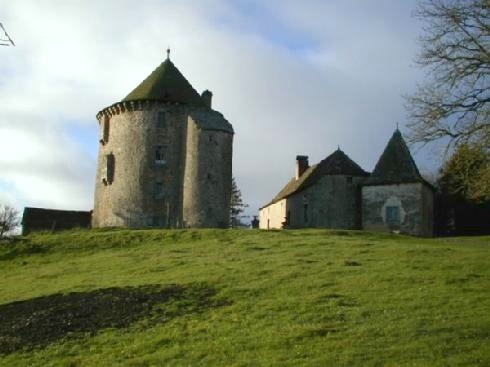 Notes: Château de Couffour is a medieval castle located in Chaudes-Aigues in the Cantal. The tower is the subject of a registration as a historic monument since September 17, 1969. The first major construction is a building of the fourteenth century, flanked on its facade of seven towers with conical roofs. There remains a tower, a building opposite, a wall and a gate forming a square courtyard. A farm just below the full set. The circular tower contains a spiral staircase which gives access to the upper floors. Several rooms have wall paintings from the seventeenth century on the grounds of flowers and female portraits. In the eighteenth century, the castle was sold to a citizen of the town. The Revolution and the early nineteenth century correspond to a period of decline. All the while, poorly maintained, the castle is deteriorating.